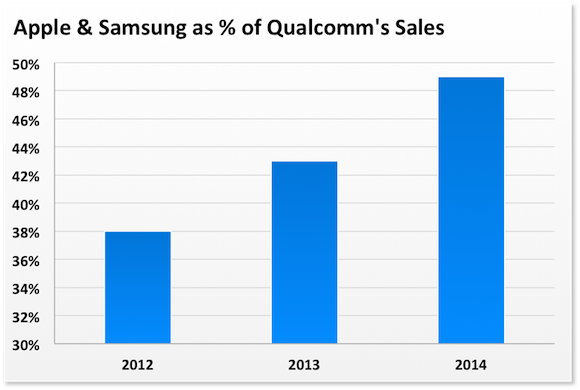 When it comes to the smartphone world, Qualcomm is one of the major dominating entities in the market. The company’s products, designs and solutions can be found in nearly every smartphone out there, ranging from flagships to mid rangers. However, Qualcomm’s seen its fortunes fall somewhat this year, given the Snapdragon 810’s less than optimum market reception owing to throttling, and Samsung choosing to use its own chipset in the Galaxy S6 Duo. Well, Qualcomm might be in for some serious bad days in the future as well. Nearly 50% of the company’s revenues are courtesy of Apple and Samsung, and a shift in policy by either two could result in Qualcomm struggling to look for more. This suggests that Apple, Samsung and their suppliers coupled with affiliates and suppliers account for nearly 50% of Qualcomm’s business. So a shift by any two in the component decisions could result in Qualcomm being left out hanging in the open. Samsung’s decision to switch to the Exynos 7420 for the Galaxy S6 Duo was a major setback for Qualcomm, and while the company’s CEO Steve Mollenkopf believes that Qualcomm can convince Samsung to revert, its still a setback for the manufacturer who once dominated completely. After all, Samsung’s JK Shin has stated in clear terms that the company considers itself to be flexible when it comes to processor choice. And Samsung’s 14nm Exynos 7420 is a processor to match any offering out their currently. In addition, while Apple does use Qualcomm’s modems exclusively in its devices, a decision by the company to switch suppliers, or develop its own technology could spin into some very bad days for Qualcomm indeed. Lets see how the company’s custom cored Snapdragon 820 pans out. Stay tuned and let us know what you think in the comments section.